Living near the Pacific Ocean has brought many a trips to the beach. It is wonderful to see the sun setting against the back drop of the sandy beaches and towering rocks. While walking down the beach you can enjoy the many types of creatures of the sea living at the beach or near it. There are crabs and star fish in the many tide pools. A multitude of sea gulls fly over head. Having a father that worked as a commercial fisherman enabled us to enjoy many types of fish for our dinners. The joy of having an extensive Burmese collection is being able to also appreciate all the small collections within the collection. One of our favorite areas deals with the sea related themes that were hand decorated on the Burmese pieces. The earliest piece we have is the #8808SB off hand vase that was hand made and mouth blown by master glassworker, Delmar Stowasser. 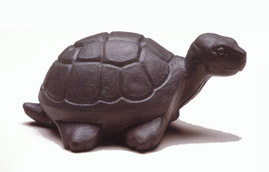 This 7 ½” tall vase called Shell was designed by Dianna Barbour. The decoration features a sea horse, shells and driftwood set near a fishing net that was made with frit. There were only 950 vases made. It was offered in the 1985 Fenton Classic Limited Edition Collectibles offering. 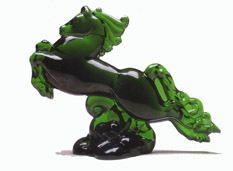 This was to honor the 100th anniversary of the creation of Burmese glass by glass craftsman Frederick Shirley. On one of the trips to Frank Fenton’s office he told us of the time he received a Shell Oil Company calendar in the mail and spotted a sea shore scene for one of the months. He thought the scene was so gorgeous that he went down to the decorating department and asked them to recreate the scene on glass. This vase was the result of his request. We were also lucky to find the same shape of vase with a different sea scene on it at the Fenton Gift shop. This vase also features a sea horse in some seaweed watching some yellow fish swimming by. This vase was hand painted by E. Thomas. In 1986 a Mariners lamp #7400SB was decorated with the same sea scene as the vase and was also designed by Dianna Barbour. This lamp was offered in the Connoisseur Collection and limited to 500. Continuing with the Shell theme was a bell #7666SB offered in the 1987 Connoisseur Collection. The bell was limited to 2500. By the time the October 1998 QVC show aired there were still bells left and it became the first Burmese piece sold on the show. Though not decorated, the Mermaid vase #8254BR is a unique piece. The vase was made as a special order for Crails in 1997 with only 57 being made. The heavily embossed vase was a former Verlys mould. The Atlantis vase #5150 was offered during the 1993 Fenton convention in the Special Glass room. The vase was available plain and decorated. Dianna Barbour designed the decorated version. Originally thought to be a former Verlys mould, it is actually a mould obtained from the US Glass Company. The next year for the 1994 annual February Fenton Gift Shop sale the #5167BR sun fish and #5193BR Fish Paperweight were offered for this special event. As a Showcase dealer exclusive in 1995, a 9 ½” tall feather vase #1649UY was hand painted with a sea scene and given the name of Sea of Dreams. The decoration was designed by Francis Burton and limited to 790. A light house scene was decorated on a #2955 vase in 2000. Kim Plauche designed the 9 ½” tall vase for the Fenton Art Glass Collectors of American convention auction. In 2001an Atlantis fairy light #C5204BW was offered for the January QVC show. The two piece fairy light mould was designed by Jon Saffell. Robin Spindler designed the decoration. A bell #5364BR with the Atlantis theme was made for the Fenton Gift Shop in 2002. Jon Saffell also designed this mould. A decorated version of this bell was offered for the April 2003 QVC program. Francis Burton designed this decoration. For the Fenton Gift Shop in 2003 a vase #7450 was decorated with a bright orange fish swimming among seaweed with an underwater castle nearby. A lasting tribute was made to honor Frank M. Fenton who passed away shortly after the Centennial celebration in 2005. As part of the 2006 Connoisseur Collection the #5062BT Nautilus vase was offered in loving memory of him. The 7 ½” tall vase was decorated with a design by Stacy Williams. She recreated the favorite scene of Frank’s from that sea scene motif of 1985. This vase is a former Cambridge mould that was acquired from the Lancaster Colony. On the bottom of this vase is a special Frank M. Fenton memorial backstamp.